Roll-In Saw built its reputation on the versatility and durability of this terrific band saw – the EF1459, a.k.a, “The Original.” This was the first saw in America to use a patented gravity-feed system that saves time and energy. The EF1459 is actually a horizontal band saw on a vertical frame. An all-purpose band saw, it handles all metals, plastics, and woods in a wide variety of cuts. It is a fast, accurate cut-off machine that is perfect for notching, slitting, and slotting. A reliable addition to your shop floor, this band saw doubles as a contour, profile, and rip saw. 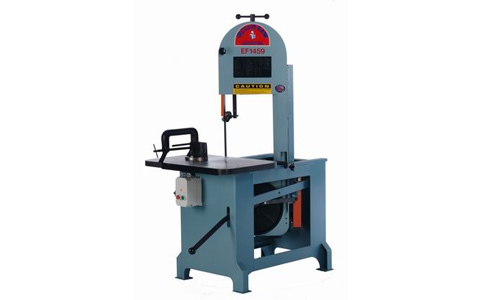 The EF1459 band saw has a capacity of 14½ inches under the guides and a 9 inch cut. The blade and vertical column travel on an inclined track that feeds into the cut in a straight path. Gravity enables the blade to find its most efficient feed rate. Counterweight control provides adjustment for optimum cutting pressure and long blade life. The work piece remains stationary and your hands need not be in the cutting area during cut-off, an important safety feature. The Roll-In Saw Vertical EF1459 is equipped with a hydraulic safety feed regulator and adjustable saw blade guard. An adjustable stop can be pre-set to control the depth that the blade travels into the work. The Roll-In Saw EF1459 is equipped with a large, rigid 18 ½ inch x 30 inch precision-ground table. Hardened grooved roller guides allow blades from ¼ to ¾ inch wide without adjustment. Blade wheels have rubber tires to prevent blade slippage. The band saw comes furnished with an angle plate swivel work block, large C-clamp, blade/speed selector chart, blade, one horsepower motor and switch. 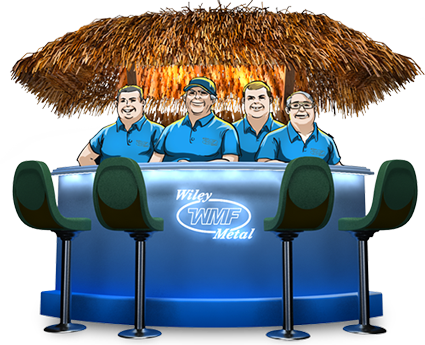 It is available in either 110V or 220V single-phase, or 220V or 440V three-phase options.